King Sa Nay ascended the throne of Mraukoo as the ninth descendant of king Min Bar clan. After king Sa Nay had passed away, minister Nga Ku Tha La, the governor of Laungkyat, took the throne of Mraukoo with the name of Na Ra Pa Ti Gyi. He asked the monks humbly whether the rib relic of Buddha and the breast-bone relic of Buddha should be moved or not as they were near the residences of Latsay lake. The monks answered pointing out the quotations logically that the relics should be moved. 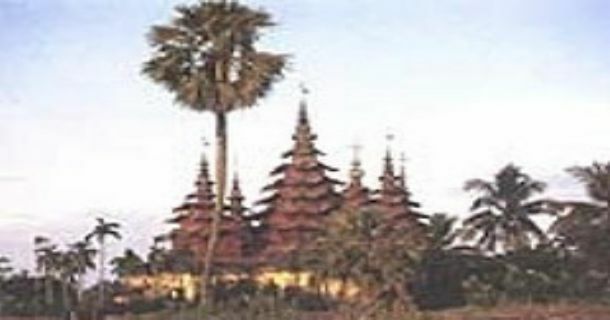 So, the king built the new pagodas on the two hills which are 100 feet high by bringing back the relics from such pagodas. King Na Ra Pa Ti Gyi foretold himself that he would be a king according to astrology. That is why the pagoda in which the rib relic of Buddha was enshrined, was named Htintawmu and the pagoda enshrining the breast-bone relic of Buddha, was named Myintawmu. Nowadays, the pagodas are damaging and covering with creepers.